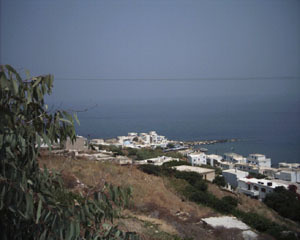 A small attractive summer resort around 48 kilometers (30 miles) northeast of Naxos Town. It is a bit too touristy in season and, by contrast, completely dead at other times of the year. Nevertheless, the beach is lovely. The reputation of its Kouros (sixth century BC) is perhaps overrated: it is a simple roughly-hewn statue. The journey between Naxos town and Apollonas, on the other hand, is very beautiful. The countryside is one of contrasts: green villages, mountains and sudden peaks.